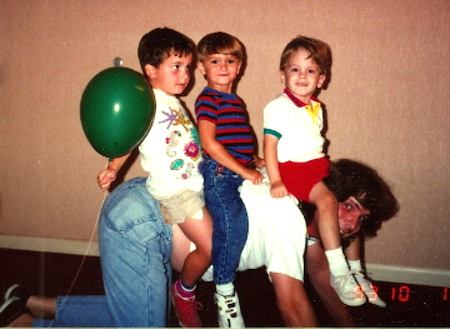 When my son was 3 years old, his favorite game to play was horsey. He’d hop on pop and we’d circle the house while he’d say, “giddy up, horsey.” I still have the scars on my knees to prove it. This picture was taken near Disney World 10/1/1993. Left to right – my nephew Ben, my nephew Ken, and my son John. Not pictured – my sister and brother laughing their heads off.